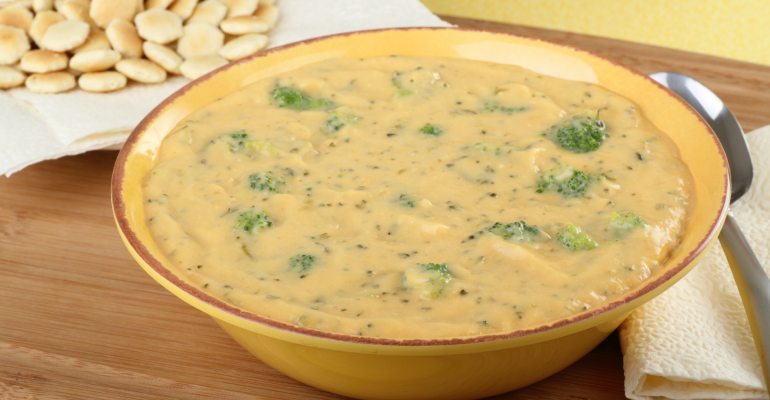 Cheddar broccoli soup is taking the world by storm…well, at least my world. My husband and kids love eating this broccoli cheese soup with grilled cheese sandwiches. Yum! Talk about having a cheese overload! Ah, it’s ok to do that once in awhile plus cheese is good for you, right? Right! I think I could nosh on cheese just about every night of the week, how about you? I have so many fond memories of eating this soup with my family but there is one memory in particular I just can’t recall! Melt butter in a pot over medium heat, then add the onions. Cook the onions for 3 to 4 minutes, then sprinkle the flour over the top. Stir to combine and cook for 1 minute or so, then pour in milk and half-and-half. Add nutmeg, then add broccoli, a small dash of salt, and plenty of black pepper. Cover and reduce heat to low. Simmer for 20 to 30 minutes, or until the broccoli is tender. Stir in cheese and allow to melt. Quick Tip: Serve this soup with grilled cheese sandwiches or crusty French bread.